Turkish sultanas have thinner crust and beautiful color is considered superior because of the high ratio of sugar. The Original name of Sultanas, seedless grapes are picked vine-covered, taking into consideration the EU standards, dipped process is done (potassium carbonate solution), dried in the sun shine with natural methods. Dipped Sultanas, are prepared for concrete dries about 10 days. If grapes don’t dip, grapes can be dried more than 20 days. Accordingly, the dried grapes dipped, color lighter, darker colored and dip grapes is called (Raisins). The Sultanas grapes after drying of the natural methods, scabs are sorted out and with they are delivered with plastic safes to factory. Our facilities are washed; oiled waste sorting and finally passed through the metal detectors with laser x-ray device is controlled. The Sultanas grapes are ready for export according to TS3411 standards. According to TS3411 standards comparing in accordance with Thompson standarts, 7-8-9-10-11 is defined as the number increases, the color will be light color size specifications. 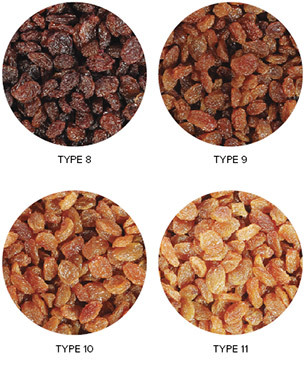 Raisins are usually mistaken for being a different variety to Sultanas. Although raisins are thought to come from darker berries, they are actually exactly the same variety: Vitis vinifera as sultanas. The reason why they are darker, is because they are not treated with Potassium Carbonate and olive oil solution - hence the drying time is longer than Sultanas. As they stay longer under the sun, they become darker in colour. Çancılar Mixed Dried Fruit is a carefully selected blend of premium quality dried currants, sultanas, raisins and citrus peel. Tradionally used in cake mixes, dried mixed fruits are widely enjoyed especially in the UK and Australia.